Everest easy trek is one of the most popular trekking trails in Nepal designed for those who wish to experience Himalayan Khumbu region in short frame of time. The Everest easy trekking includes unique culture, traditions, a lifestyle of the local people, rich biodiversity, and majestic mountains of this region. In this trek, many more spectacular and beautiful mountains are the main attractions. This trek brings you to the view of four great peaks which are above 8000m such as Mt. Everest-8848m, Cho Oyu-8153m, Lhotse-8516m, and Makalu-8463m. This type of trek is suitable for those who can walk about 4 to 5 hours a day and can move within the limited time to be taken a trek for all the way of Everest region trekking in Nepal. Everest easy trek starts with a short flight to Lukla and trekking to Monjo. The trek continues through the lush vegetation of Sagarmatha National Park which is the habitat for very rare wild animals like Snow leopard and wild goat. The route passes through abundant flora and fauna, colorful prayer flags, dense spectacular forests of blooming rhododendron, blue pine, orchid and fir forests of the Khumbu and Everest region. We pass through friendly Sherpa villages and Buddhist monasteries of Namche Bazaar where we will offer with an incredible vista of Mt Everest (8,848m), Lhotse (8,501m), Thamserku (6,502m), Ama Dablam (6,450m) Kusumkanggaru along with the snowy peak of Khumbu Himalaya Nepal. The Everest Easy trekking proceeds experiencing the natural beauty, astonishing landscape and magnificent view of Himalayas to Tengboche. Exploring the famous historical monastery in Tengboche, we will trek on easy Everest trail to Khumjung valley and Phakding. Khumbu Valley is one of the oldest and largest Sherpa settlements in the Khumbu region (Everest region). Everest easy trek is for those who have a shorter holiday and would like to view the world’s highest peaks from comfortable elevation and enjoy the medley adventure. 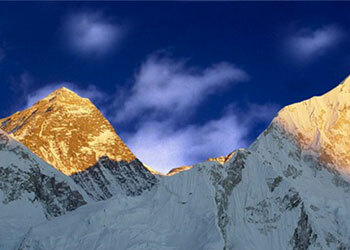 When it comes to spectacular breathtaking mountain panoramas, the Trekking easy in Everest is without equal. Back down to Lukla from where we will take a short flight back to Kathmandu, enjoying the last views of the awe-inspiring Himalayan range and its people. Duration: 08 Days from arrival to departure in Nepal. Trip Snippets: 08 days, 02 night’s hotels, 06 nights Lodges, Breakfast in the city, 3 meals a day ( breakfast, lunch, and dinner ) during the trek are included. Meet at Kathmandu Airport and transfer to hotel. After freshen up meeting will be conducted in our office with a guide, arranging permit and checking the trekking equipment and other necessary things. Early morning we fly from Kathmandu to Lukla via mountain flight of about 40 minutes scenic flight. With clear weather, we get fantastic views of the mountains, including Everest as we enter deep gorge of the Dudh Kosi valley. You begin your trek from Lukla following a beautiful and easy walk through blue pine and rhododendron forest. After trekking of 3-4 hrs, you’ll be at Monjo. Spent your night at one of the good lodges here. Today the trail passes waterfalls and naturally occurring items of interest. Villages are interspersed with magnificent forests of Rhododendron, Magnolia and fir. Along the way to you will be rewarded with your first glimpse of Kusum Kangru (6369m), Thamserku (6608m), Everest (8848m) and Nuptse (7879 m). A steep climb up to the beautiful village of Namche Bazaar will afford you further spectacular views and a comfortable place to spend the second night of the trek. Trek starts after breakfast in Namche and trails follows colorful prayer flags, with several, shorten and Mani stones from Namche Gompa. Thame is a small monastery village, situated at the altitude of 3825m and the birthplace of Tenzing Norgay Sherpa first man to reach Everest summit with Edmund Hillary. After morning trip around Thame village, have breakfast and slightly visiting Khumjung the largest settlement of Khumbu Valley is one of the oldest and largest Sherpa settlements in the Khumbu region (Everest region). The valley is surrounded by the snowy peaks of Kongde and Thamserku. We can take a take a short hike up to the monastery to view the yeti “scalp” at the Khumjung monastery. walk downhill to Namche Bazaar and overnight at Guest House. The trail steeply goes downhill through Rhododendron and Pine forest to Jorasalle it will take about two hours and another 5-hour walk to Lukla via Monju, banker, Phakding, Ghats Chaurikharka, Chheplung and arrival in Lukla and overnight at Guesthouse. After Namche Bazaar the trail descends steeply back to Dudh Koshi River. We can enjoy a gentle walk on the trail Jorsalle. We will work through the forest of magnolia, giant firs and rhododendrons with the view of distance snow covered peak before arriving Phakding. Can have lunch stop there and continue to trek back to Lukla. The trail drops steeply and runs level through blue pine and rhododendron forest. Enjoying the lush green scenery around and passing through the incredible mountain scenery and local Sherpa village arrival in Lukla. We return to the hustle and bustle of Kathmandu with a 45-minute flight back to the domestic airport. (It also can be a spare day in case of bad weather in Lukla which makes the Lukla flight delayed and cancel.) In the evening you can have your last night in Nepal enjoying the Nepali cultural dinner show exchanging greetings among friends and with other Nepalese people.